If you're considering getting a skull tattoo, then you're not alone! 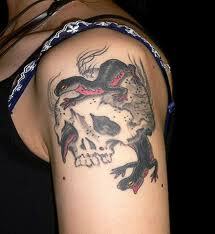 Skull tattoos are one of the coolest, most interesting type of tattoo to get. In this guide, we're going to take a closer look at some of the main design ideas available to you. So let's begin. Firstly, you can get a skull in a wide variety of locations. 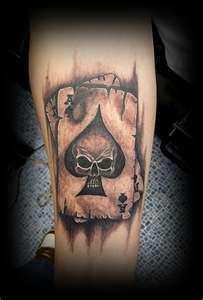 However, they are usually places on the arm and shoulder area, either as a full or half sleeve, or a smaller skull-style icon. The simpler designs often incorporate tribal styling as well, which tends to flow around the skull shape - often in the style of pointed wings. If you're looking for something more artistic, then there's a lot of choice. You can find intimidating hellish designs which usually include lots of bold, striking color to illustrate flames, fire, and other ghoulish design ideas. For a more comic effect, you can find designs which include skulls smoking cigarettes, or cartoonish design. 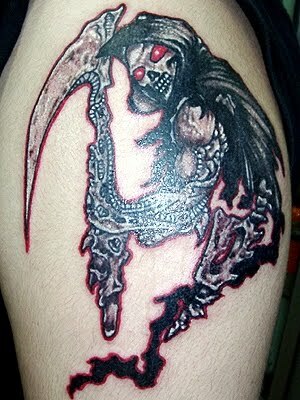 For a more chilling effect, you can go for a demonic design, which often includes horror elements such as blood, grim reaper scythes, and swords or other weapons. Some of the artistic designs occasionally use an "almost human" style of face, with parts of the skull creeping through. This can create a chilling, haunting effect. 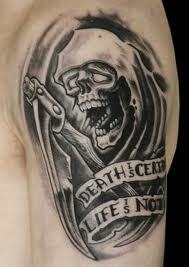 But be warned - your tattoo is sure to scare kids! Death and demonic themes are hugely prevalent in skull designs, so most of the designs are created to give an intimidating feel. However, some of them also include flowers - particularly roses - for a bitter-sweet romantic feel. 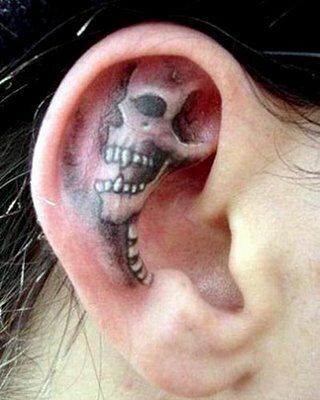 If you're looking for something unconventional, a little scary, or funny - then getting a skull tattoo may be for you. But remember, there's many, many different designs in this category - so it's worth doing some research before you pick one in particular. 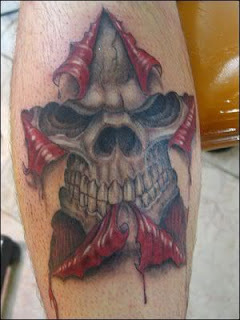 In the past, skull tattoo designs have been associated with biker gangs and other rough members of society; partly due to the motion picture industry and the given reputation surrounding these individuals. 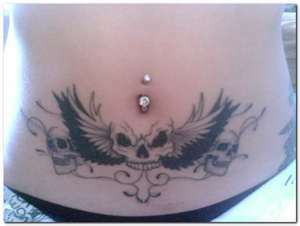 Times have changed, as this style of tattoo has. This design and its symbolic meaning have evolved over the years. Following are some interpretations. What does the grim reaper convey to you? It is not associated with Satan as some believe, nor does it represent simple death. 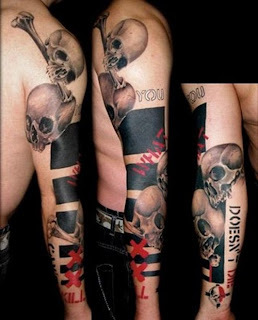 These hooded skull tattoo designs are a reminder from medieval times that life is infinite and it suggests that there is life after death. This design is known universally as the sign for poison and is seen on household cleaners and other substances. The image is white placed upon a black flag. This design has other meanings as well, depending on the views of its recipient. Men choose it for its representation of masculinity and the stigma surrounding it, while others choose this design to mean change, such as those recovering from addictions who wish to remind themselves of where they have been and the changes they have undergone in life. 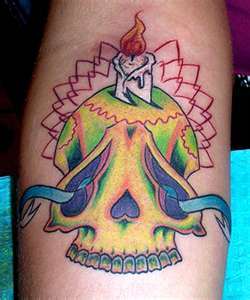 These skull tattoo designs are often associated with western areas or tribal art. An avid hunter may choose a dear and a set of trophy horns to display. A bull skull is often displayed in a dessert scene along with predatory birds such as the vulture. Add a few cactus and one is reminded of our beautiful state Arizona. This type of design is used as a memoriam to honor a loved one who has passed on. A name is engraved and the colors are richly blended together. It can also be construed as a symbol of life. Often you will see flowers in the mix with a sugar skull design. Birds, snakes and insects can be integrated to offer a story line to the design. The phases of life and nature can be seen in some full back tattoos. The skull is the center piece with other depictions surrounding it. 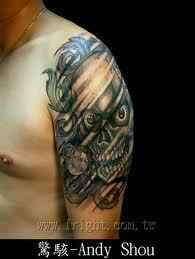 Skull design tattoos can be richly ornate or simplistic. They can be dramatic or cartoon-like, small or large. There endless possibilities that are only limited by the imagination. Their true meaning lies with the one who wears them. The rest of the world is free to offer its own interpretation.. Part of the beauty of body art is the canvas itself. 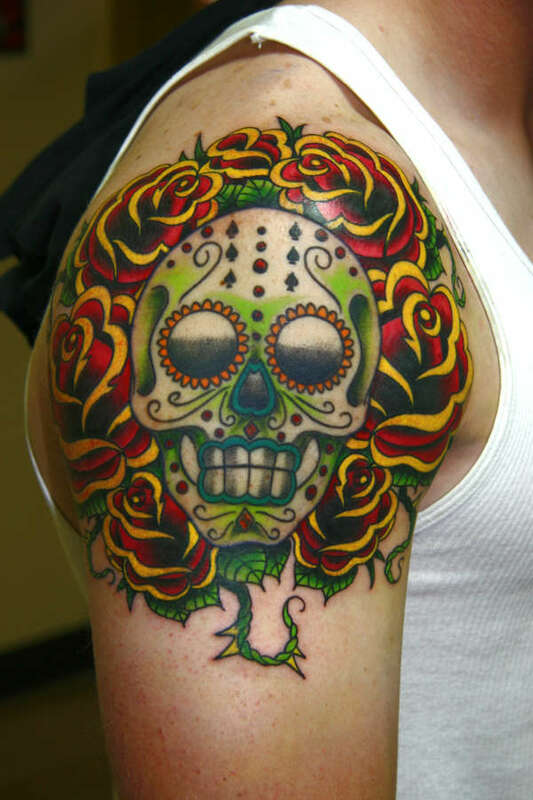 By choosing a design that represents a part of yourself, a tattoo becomes more than an image.